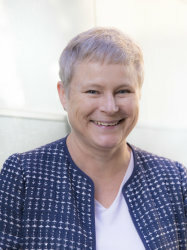 Professor Deborah Ashby is Director of the School of Public Health and holds the Chair in Medical Statistics and Clinical Trials at Imperial College London. Her research interests are in clinical trials, risk-benefit decision making for medicines, and the utility of Bayesian approaches in these areas. She was founding Co-Director of Imperial Clinical Trials Unit. Professor Ashby is President of the Royal Statistical Society for 2019 and 2020 and is Chair of the Population Research Committee for Cancer Research UK. She is a Chartered Statistician, and an Honorary Member of both the Faculty of Public Health Medicine and the Royal College of Radiologists. Professor Ashby was awarded the OBE for services to medicine in the 2009 New Years Honours List, was appointed an NIHR Senior Investigator in 2010, and elected to the Academy of Medical Sciences in 2012.